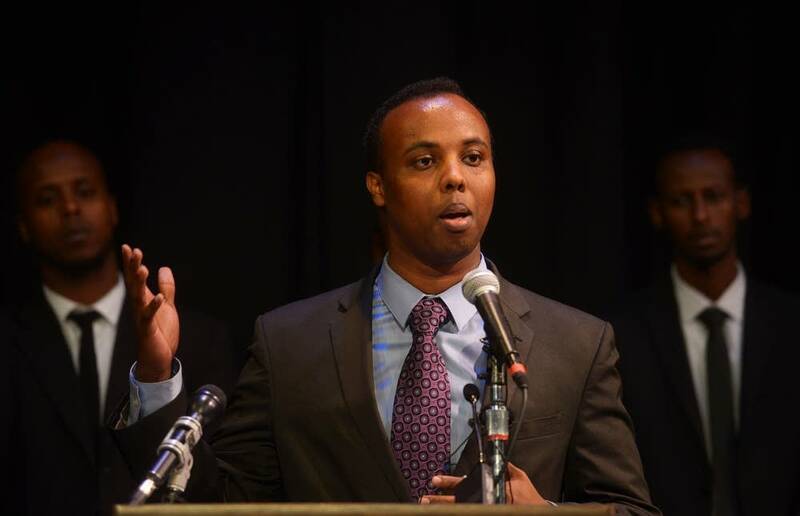 Updated 5:12 p.m. | Posted 8:21 a.m.
A prominent nonprofit serving Somali-American youth has refused a $500,000 grant from the federal Department of Homeland Security in light of President Trump's refugee and travel restrictions. Ka Joog was one of two Minnesota groups that had received funding in the latest round of the nation's Countering Violent Extremism program, known as CVE. Over the years, the arts-focused organization has won accolades from the FBI and other government agencies for trying to steer kids away from radical ideology. But this week the group announced it could no longer accept the money. In a statement released late Wednesday, Ka Joog leaders said, "As Minnesotans, we are deeply troubled by our nation's new administration and their policies which promote hate, fear, uncertainty, and even worse, an unofficial war on Muslim-Americans and Immigration." The announcement came out just hours after Reuters reported that Trump would focus CVE solely on preventing radical Islam and would no longer target groups such as white supremacist who have carried out bombings and shootings across the country. A Department of Homeland Security spokesperson declined to comment on the report Thursday. Ka Joog's decision may portend that just 12 days into Trump's administration, the current political climate will make it tough for Muslim community leaders — even those who have been supportive of CVE in the past — to work with federal authorities. "They've been put in an untenable position politically within their own communities," said William Braniff, executive director of the National Consortium for the Study of Terrorism and Responses to Terrorism. "They've been arguing within their community contexts that CVE is not just about the government's targeting of Muslims and Islam, that it's really about building healthier communities and resilience. And now they're not going to be able to make that argument." It's also worth noting that aside from the Sept. 11 and Oklahoma City bombing attacks, far more ideologically driven homicides in the United States were committed by far-right extremists than jihadists, Braniff said. From 1990 to 2015, there were 196 fatal attacks in the U.S. carried out by far-right extremists, compared with 43 fatal incidents associated with Muslim extremist movements, according to a figures tracked by Braniff's consortium. So while violent Muslim extremism represents the most dangerous kind of terrorism around the world — one that could project more violence into the United States — domestically, the violent far-right movement is more active, Braniff said. "What I don't understand is a conscious decision to only take the most serious threat seriously, and not the second-most serious threat and third-most serious threat," he said. "We don't just worry about one kind of cancer and then drive recklessly when we get in our cars every day." U.S. Attorney Andrew Luger, who spearheaded a local pilot program aimed at making Somali-American youth more resilient to radicalization, declined to be interviewed. He did, however, release a statement in response to the reported CVE shift, and referenced discrimination toward the local Somali community. "For the past three years, I have worked closely with Somali and community leaders to tackle the pervasive threat of terror recruiting," Luger said. "While engaged in this collaborative work with community leaders, I have witnessed firsthand the hurtful and damaging reality of Islamophobia. I look forward to an ongoing relationship with my community partners to address each of these issues as we continue to protect the safety and security of Minnesotans." The $500,000 grant would have exceeded Ka Joog's annual revenue of about $385,000, but the group decided it had to take a stand, said executive director Mohamed Farah. "We could have done so many great things with the money, but for us it was about principle," said Farah, whose group won a $200,000 grant in November from the Minnesota Department of Employment and Economic Development. Trump, he added, "is "promoting ideology based on division. We want to do everything we can to distance ourselves from him." A second Minnesota group that won a CVE grant last month has been working to rehabilitate Abdullahi Yusuf, a cooperating defendant in Minnesota's ISIS cases. The Department of Homeland Security awarded Heartland Democracy about $165,000. It was not immediately clear whether Heartland Democracy would accept the money in light of Ka Joog's decision. Its director, Mary McKinley, said Thursday she and her board were working on a statement this week. But some CVE supporters expect other recipients to bail out. Leaders of Advancing & Helping Communities, a Michigan-based group led by Lebanese-Americans, have declined a $500,000 DHS grant it had sought, according to the Reuters report. But even before the news broke about Trump's intentions for the CVE program, Twin Cities Somali-Americans were wildly mixed on whether groups should be associated with programs aimed at preventing terrorism. Some say CVE, as well as the statewide Building Community Resilience program championed by Luger, stigmatize Somali youth. Rep. Ilhan Omar, DFL-Minneapolis, the nation's first state legislator of Somali descent, has been critical of such programs. Omar said nonprofits seeking money to help Somali-American kids should continue to do so, but not by promising that their after school programs can somehow prevent them from becoming terrorists. "I find that disheartening, I find it disappointing, and I find it a little disgusting that people would exploit their community and resources to gain off of it, knowing it is not going to be beneficial," Omar said in an interview. "It's further going to marginalize these young people, Somalis, and Muslims. Right now what we need is for young people to see themselves as part of the system and to feel hope."